We know that many of you have been waiting for this one, so we’re really pumped to release WooCommerce Social Login out into the wild 🙂 . Want to pick it up by 11am EST on August 13? Use the coupon code woocommerce-social-login for 25% off! Sounds Cool. What does this do? eCommerce has been growing rapidly and will continue to do so. As more users purchase from online stores, they’ve discovered something about their shopping habits. For every store they visit, they’ll either have to check out as a guest (which requires them to constantly enter personal information) or they have to remember about a zillion username and password combos. Even worse, some customers use the same credentials for every site so they can remember them. When customers use the same username and password combo, they’re participating in a habit that is incredibly lacking in security and only requires one site breach to expose their personal data across many sites. For example, if I did this and my Amazon.com credentials were breached, this information could be used at tons of sites, from PapaJohns.com to Nordstrom.com. To combat this, many stores now offer social sign-in. 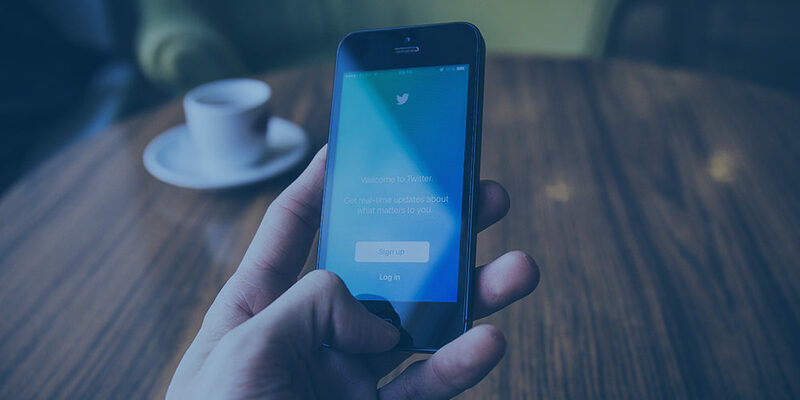 Customers can link social accounts, such as Facebook or Twitter, to login information so that they can securely log into their favorite eCommerce stores without (a) risking security by using the same credentials and (b) remembering tons of login combinations. Social Login is a win-win for customers and shop owners, as security is increased by using a secure social sign-in method, and customers can easily float from site to site without using several sets of login credentials. Want some research on how popular and useful social login is? We have lots of it on the WooCommerce Social Login product page. Got it. Any other benefits? Yes! Almost every customer has come across social sign-in, and they’re far more likely to create an account with social login than check out as a guest. That means you’ve just made a repeat visit to your site far easier for this customer, as they’ll be able to save personal details to their new account. Customers tend to stay signed into social accounts, which means they’ll always be signed in when they visit your store. This reduces friction when purchasing, as customer’s will be logged into your store, and personal details (like shipping information) are ready to go. Ordering from your store becomes as seamless as possible. 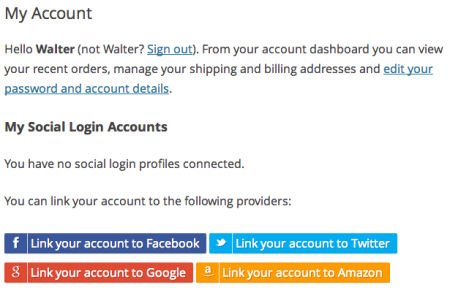 WooCommerce Social Login lets customers link Facebook, Twitter, Google, and/or Amazon to your WooCommerce store to benefit from secure and easy sign-in. With these four networks, we’ve covered over 87% of social sign ins. Awesome! 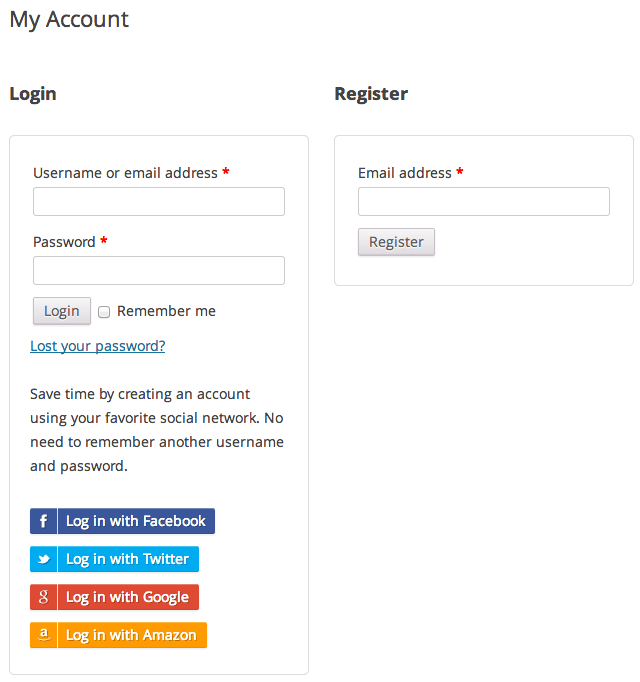 What else does WooCommerce Social Login do? Once you’ve created apps for your store with each social network (don’t worry, we have detailed instructions on this! ), you can enable social login with each of these networks. You can also vote for the next networks to be added in the plugin documentation. As a shop manager, you can also check out how many users have registered with social accounts by viewing the admin reports for “Social Registration” with the customer reports. 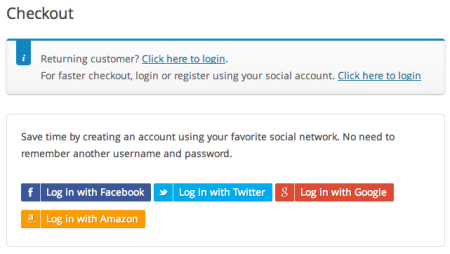 Even if customers unlink all social accounts or you stop using the plugin, they’ll still have accounts available for your store! WordPress user accounts are created with the email that’s tied to their social account (the exception to this is Twitter, who doesn’t return an email – a username is added and set to the Twitter handle). This makes it possible to reset the password and use accounts normally if customers unlink accounts or the extension is deactivated. Ready for purchasing or more details? Check out the plugin page at WooCommerce or view the full documentation. We just purchased (25 sites) license for WooCommerce Social Login to use with Woothemes Sensei LMS. Looking forward to testing Social Login! Because the user expiration is to change the user’s WordPress login password, won’t the Social Login as the password be incompatible? Meaning even if we set an expiration 90 days after purchase of a course, the User will still be able to use Social Login to successfully login? Back up plan is: Disabling a User Account http://wordpress.org/plugins/disable-users/ – this should already work with Social Login. Unfortunately this is manual (and not x days after purchase). Hey Kelly, you’re correct that expiring the user account won’t work, as Social Login doesn’t pay attention to the password when logging the user in. Disabling the user account will definitely work, as the social account is tied to the WordPress user account. You could make this automatic with custom code if needed. Would love to hear what you think as you use the plugin! how do you make the App in Facebook? it seems very complicated. I purchase a 5 site license and i am stuck. Any guidance appreciate. Thank you ~ took a few minutes but i got it. appreciate it. Hey there, Social Login only affects your WooCommerce login / registration pages, so you can definitely use Theme My Login for the WordPress login page 🙂 . How does this compare to the Nextend Facebook connect plugin? I am using the Flatsome theme for woocommerce and am interested in social login. Since the Nextend plugin is free and integration comes with my theme, I am wondering what is the difference? Maybe it is obvious and I am idiot, but would love to know so that I can decide asap. Hey Justin! This is a good question 🙂 . That plugin will add Facebook login buttons, while our plugin can be used to log in with Facebook, Twitter, Amazon, Google, PayPal, Instagram, or LinkedIn. The Nextend plugin is also designed to integrate with the WordPress login forms, while ours is geared towards integrating into your WooCommerce checkout and login flow. 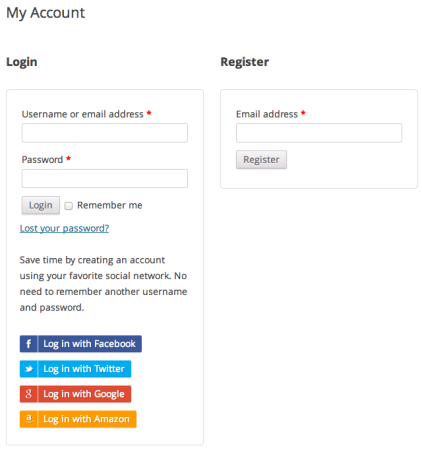 The buttons for social login can be displayed on WooCommerce “My Account” pages, but can also be placed on the checkout form to speed up registration at checkout, encouraging users to complete a social login when purchasing and reducing the barrier of creating a user account while trying to buy something from you. 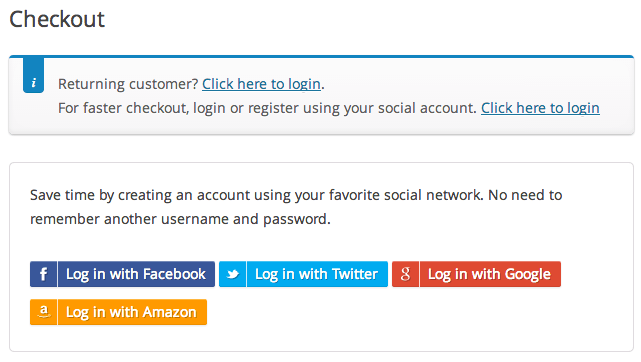 You can also ask customers to use social login on the “Order Received” page for faster checkout in the future. Both will let users log in with Facebook, but ours is designed to do so to make the WooCommerce shopping experience smoother and will let you to use other networks. Thanks. Can you recommend any websites that are using this plugin that have a good checkout flow? I am not smitten with woo’s checkout because, at least on the theme that we are developing, the sign-in appears on the payment page. Where would the social login buttons go? It would be great to see a few best practices before going forward so that I can make a single intelligent integration along with any custom work that may be needed. Hey Justin, I’m afraid we don’t collect data on sites using our plugin for privacy, but you can check out our checkout process with this sample product. However, where sign-in notices and social login buttons appear is entirely up to you, and can be changed in your WooCommerce settings. You can even remove the WooCommerce sign in at checkout, but this is a page your customers are guaranteed to see, which is why they’re here by default. If you change this, I’d recommend ensuring that customers hit a login page at some point before checkout. You can automatically add the social buttons to the checkout page, My Account, and Order Received page, but you can manually add them with a widget or with shortcode on any page. For example, you could use the shortcode to add them to the Cart page instead. this is the most awesome social plugin, does a whole lot more than any other. also, skyverge continues to add and develop this to ease the way to more productive websites. Hey Beetzy, thanks for the kind words! So glad to hear you’ve found it useful 🙂 . can you help me to solve this error ? Hey there, we’d be happy to check this out! Could you please submit a support ticket here so we can get the needed info, and then reply back with the 6-digit ticket number? That way I can pull the ticket and make sure it’s assigned. Thanks!